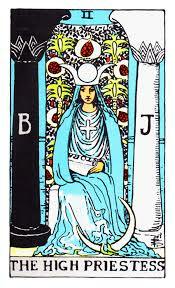 card number 2 is HIGH PRIESTESS. In starting fool is cord is considered a male child when it go towards THE MAGICIAN it get masculine energy and the high priestess to have feminine energy. so now the fool spit into male and female and also positive and negative, which is shown by pillars in the Image. when we see the image She sits between the darkness and the light, represented by the pillars of Solomon’s temple, which suggests it is she who is the mediator of the passage into the depth of reality. where the magician shows outer part of ourselves the high priestess shows inner.The blue robe the Priestess is wearing is a symbol of knowledge.The solar cross on her breast is a symbol represents the balance between male and female.